Major (retired) Jason Criss Howk, is an author, public speaker, adjunct lecturer, and advisor. He focuses on Islam, foreign policy, national security, leadership, and strategy. He retired after 23 years in the U.S. Army operating on joint, interagency, and multinational teams conducting defense, diplomacy, education, and intelligence missions. He holds an MA in Middle East & South Asia Security Studies from the Naval Postgraduate School, studied Dari and Arabic at the Defense Language Institute, and has focused his career on the broader Middle East and the Islamic World. ​ He is a Malone Fellow in Arab and Islamic Studies and a former term member on the Council on Foreign Relations. He is currently leading interfaith dialogues across the United States to educate people about the differences among the religion of Islam and the concept of Islamism as a political ideology. His aim is to increase interreligious understanding and promote peaceful coexistence. Religion, faith and belief are all topics of a controversial nature. It's controversial because it depends upon who you're talking to and their interpretation of what they're reading. The King James Bible, the Qur’an and the Hebrew Bible (also known as the Tanakh) are some of the books that hold spiritual values, scriptures and actions of God that formulate a connection with the reader. 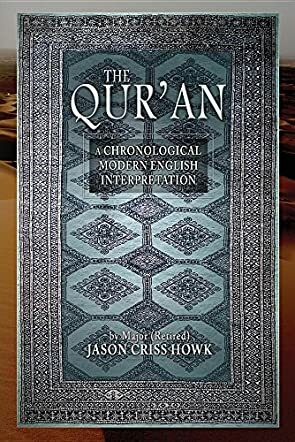 The Qur'an: A Chronological Modern English Interpretation by Jason Criss Howk is a modern day English interpretation of the Qur’an. Jason Criss Howk began this journey because he wanted to improve the collective interaction between religions and faiths. He also wanted to provide others with clarity on what Islam and the Qur’an stand for and to dispel the myth that all Muslims are terrorists and that the Qur’an teaches hate. If you really want to learn about the Qur’an, there is a wealth of information in this book. While this is a comprehensive, detailed resource of information just like the King James and Hebrew Bible, Jason Criss Howk had to manipulate some of the order of the words to create a platform for reading and understanding of the passages for the English interpretation. If you are new to the Qur’an, understand that the format is different than the Bible. If you are familiar with the King James Bible or the Hebrew Bible, be prepared to make a paradigm shift as you begin to study the Qur’an. I'm a researcher on many things because I desire to be educated on a subject instead of reacting to what I hear or what I'm told, especially via traditional media. Through studying, I discovered that the Hebrew Bible and the Qur’an were both created from the main concept, scriptures and messages of the Bible and then massaged according to the needs of the religion, faith or belief embracing the change. It's not these various materials causing the attacks within the world in the name of (______ you fill in the blank), it's the reader and their interpretation coupled with the elements of their heart, soul and spirit. If water is poured into a leaking bucket, then no matter how much you pour into it, it will never retain the water. Only when the bucket is either repaired or replaced can the task of filling it be accomplished; such it is with man. If you want to gain knowledge and understanding about the world around you, begin here.